How does Acupuncture work & what does it treat? Acupuncture uses single use disposable needles that are inserted into certain points in the body depending on your condition. Within our body we have an ability to heal ourselves. For example, when you get the common cold and you don't take any medication for it, eventually your body has the ability to overcome the cold and get better due to the body's internal healing mechanisms. Acupuncture works on this same premise and helps to promote your body's own internal healing abilities from the inside. Acupuncture facilitates your body's own production of natural endorphins or painkillers which is why it can be so beneficial in the reduction of pain. Acupuncture also has the ability to act as an anti-inflammatory as well increasing local blood flow and circulation to certain areas of the body. No, acupuncture does not hurt. Occasionally, there will be a slight pinch where the needle is inserted almost like a mosquito bite. 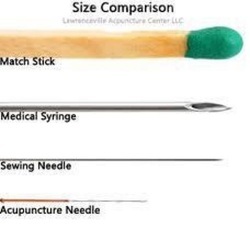 The size of an acupuncture needle is about the thickness as a strand of hair. Patients will often say that they did not even feel the needle being inserted. Once the needle is in you may feel a heavy sensation, dull ache or slight tingle where the needle has been inserted but this will often dissipate almost instantly. Many patients will feel a deep relaxation and calmness once the needles are inserted and many people often fall asleep while the needles are in. Since acupuncture promotes your bodys own ability to heal itself every patient will respond differently to acupuncture. Some symptoms will resolve after the first treatment while others may take 4-10 treatments. Acupuncture has an accumulative effect on your body with each treatment building on the next. The length of your condition, severity and current condition all plays a role in how many treatments may be necessary for your condition. Yes, many people have a fear of needles. If someone has a fear of needles, we will only use a minimal number of needles. However, most people who have a fear of needles often do not have a problem with acupuncture needles due to the small size of the needle. Cupping, moxa, gua sha or tui na might be utilized instead of acupuncture. Yes, I perform dry needling. Most insurance companies in PA do not cover acupuncture. However, you should call your insurance to see if they cover any percentage or any visits. If so, we would be happy to accept your insurance. Most chiropractic insurance is accepted. We also offer a time-of-service acupuncture discount with your chiropractic visit. At this time, we do not accept Medicare and Medicare does not cover Acupuncture. Do you accept flex spending cards? Yes, we accept flex spending cards. Do you offer a Student Discount on Acupuncture?